Starting November 30, 2017, several of us at Ford’s Theatre will metaphorically put on our lab coats and do a series of experiments. On certain days in December, March and May, you may see us wandering the site wearing lanyards reading “D.R.A.F.T.”—that’s Design Research at Ford’s Theatre. We’re carrying out a set of six prototyping tests that we’re calling “sprints” to explore a variety of interpretive tools and strategies on-site. These visitor tests will help inform future plans for our museum and how people—especially students—interact with it. We hope to learn more about our visitors’ needs and how we can improve the experience for all who come to Ford’s Theatre. Some of these “sprints” will be successes and some will be failures. All will be learning experiences. This project didn’t come out of thin air but, rather, is a second attempt to work out some underlying issues with student engagement here at Ford’s. You see, we’ve been watching how visitors behave in our museum: where they stop to read, examine artifacts, view video and interact with exhibit touch screens, statues and other features, and what areas are drawing less visitor attention or being bypassed entirely. We wanted to fill in those gaps for visitors and find a new way for the more than 200,000 students who visit every year, in particular, to get the most from of their visits. 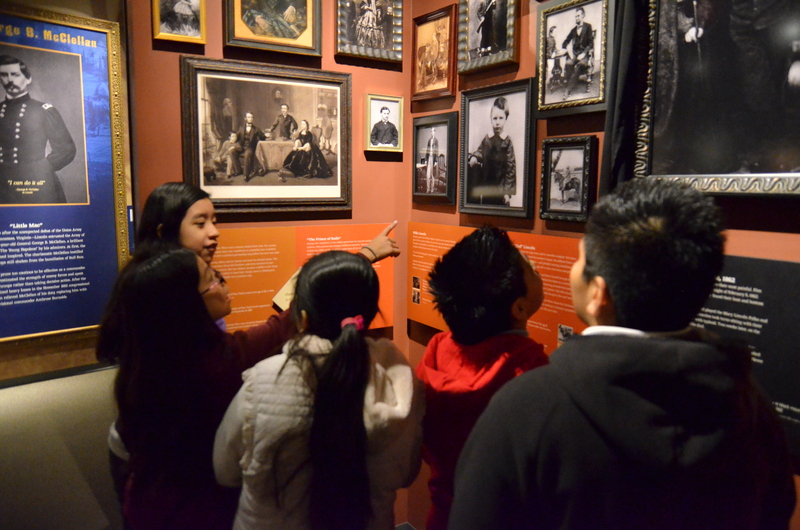 Photo of students in the Ford's Theatre Museum by Gary Erskine. Anecdotally, we noticed that many students seemed to get bored in the basement museum, where they spend 25 minutes before going to see the theatre itself. Knowing that we needed to work with what we had—that exhibition changes would be a long time coming—we sought funds from the Institute for Museum and Library Services (IMLS) in 2015 to build something allowing students to use their own mobile devices to interact with history content on site. We called this project the “mobile interpretive solution” because we didn’t want to commit to building a mobile website or an app—or some unforeseen product—before further exploration. At the time, mobile seemed like the best solution to engage students on-site. Mobile in museums is still in its infancy, but some projects, like the Minnesota Historical Society’s Play the Past, have shown great potential. Anecdotal evidence suggested that roughly 80 percent of students visiting Ford’s were carrying their own mobile devices. Mobile could allow for a greater personalization of the experience in the museum and use other means than words on the wall to connect students with the fascinating artifacts and stories. Mobile might even allow for students to be, essentially, detectives investigating the Lincoln assassination. We could also see what was working and not working via device or app analytics, and update content immediately—something you can’t always do with physical displays. While we awaited the outcome of the grant application, in spring 2016 we proceeded with audience research, guided by Marianna Adams of Audience Focus, Inc. This research included a timing-and-tracking study—our intern at the time, Allison Van Gilst, followed student groups around the museum and recorded their locations and behaviors every five minutes—as well as interviews with students and post-visit surveys filled out by both students and their teachers. The report showed that, indeed, students disengaged in the museum after some time had passed. 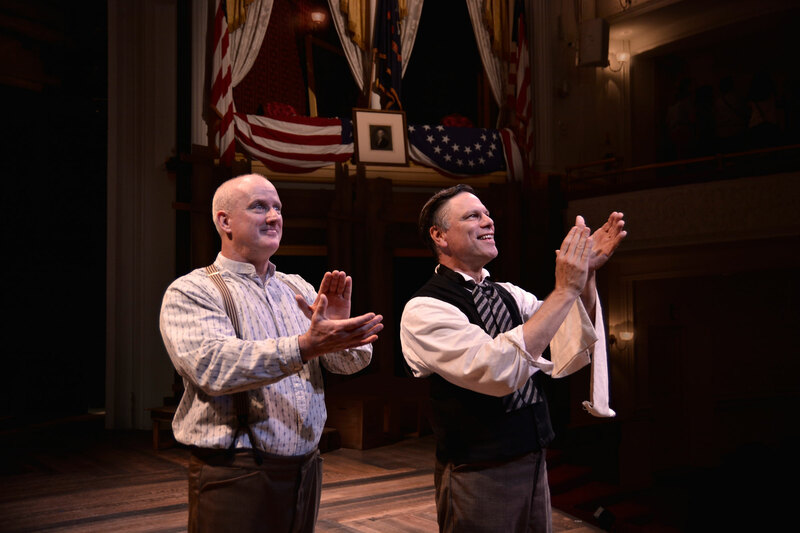 Performances of "One Destiny" are available to daytime visitors during spring and summer at Ford's Theatre. Photo of actors Michael Bunce and Stephen F. Schmidt by Gary Erskine. Another interesting piece of information popped out: Students who were interviewed before a program in the theatre itself wondered about what the purpose of their museum visit was. Students interviewed after a ranger talk or showing of the play One Destiny commented on how much they loved seeing artifacts related to the assassination in the museum. This showed the need to scaffold the experience—something that any mobile interpretive solution would need to do. Apparently, IMLS’s reviewers agreed with our original logic, as we were awarded a grant to fund this in September 2016. We proceeded to issue a request for proposals for a developer for the mobile interpretive solution. But when we issued the RFP, we also were in the beginning stages of executing other projects in our digital strategy: digital signage and a “Tenth Street Experience”—using technology to take visitors back to 1865 so they could experience what the streetscape between Ford’s Theatre and the Petersen House was like then. Although these projects were proceeding on separate tracks, they would happen in the same physical spaces. So, based on discussions with vendors during the bid process, we decided to do a unified concept phase for the three projects together. This would allow for all of the concepts to be considered in relation to each other. The advisors particularly gravitated toward first-person accounts, and suggested that we focus on creating content that could be used in a variety of platforms. 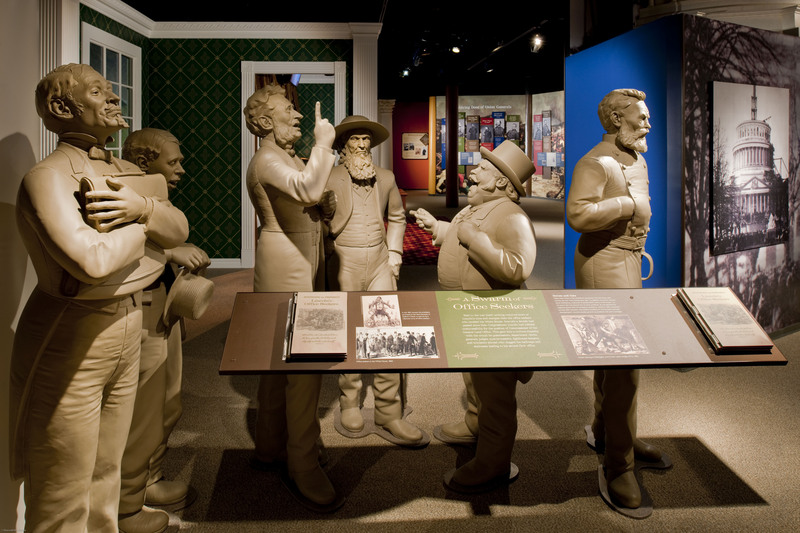 1860s Office Seekers display at the Ford's Theatre Museum. Photo by Maxwell MacKenzie. The advisors raised another issue that kept coming up in subsequent months. They cautioned us about using mobile, citing low download rates—few museums or historic sites find more than three percent of visitors engaged with museum apps or websites on mobile devices—and difficulties in getting visitors on board. For example, Play the Past, perhaps the most successful museum mobile experience, only reaches a significant portion of the Minnesota History Center’s student visitors through an experience facilitated by museum teachers—something neither feasible nor desirable at our site. Further field research (including surveying students while they waited in line and two days of on-site observations by Bluecadet), analysis of other museums’ experiences and discussions with stakeholders kept raising this issue. Meanwhile, some of our underlying circumstances changed as well—it began to appear that changing multiple aspects of the visitor experience to rectify the issues previously identified might be more possible than we previously anticipated. Given all of this, could we pivot? This new learning and changed circumstances brought us to alter our approach. Thankfully, IMLS was willing to work with us, since the scope of the project, its eventual outcome—creating a better student experience—didn’t change; only the methodology did. Instead of creating a “mobile interpretive solution” that would not reach many more people than we already do with guided tours and would change as the site experience changes, we are working with Haley Goldman on a set of prototyping exercises, as well as planning and installing digital signage to alleviate on-site wayfinding issues. Often, planning a new or revised museum experience is a guessing game—an expensive one at that. Learning from the field of human-centered design, we are following the footsteps of others in the museum field and taking an experimental approach—thinking of an idea and testing it immediately with real people to learn what works and doesn’t. And, we invite you to learn with us! We’ll blog about each of our sprints, so keep an eye out here to learn more! David McKenzie is Associate Director for Interpretive Resources at Ford’s Theatre. He also is currently a History Ph.D. candidate at George Mason University, studying 19th-century U.S. and Latin American history, as well as digital history. Before coming to Ford’s in 2013, he worked at the Jewish Historical Society of Greater Washington, The Design Minds, Inc. and at the Alamo. Follow him on Twitter @dpmckenzie.